The power system based on renewable energy sources is functioning in the active mode in the Institute of Nondestructive Testing of the Tomsk Polytechnic University. 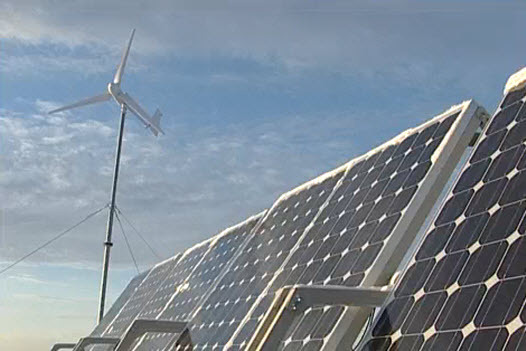 The electricity is being generated by the two wind turbines and solar panels. It should be reminded that on August 20 the governor of the Tomsk region Sergey Zhvachkin signed a cooperation agreement with the International Finance Corporation on the development of renewable energy sources. It is noted that the regional authorities are thus expect to attract extra-budgetary investment for regional energy efficiency programs. Meanwhile, it has been much more than one year that the staff of the Polytechnic is using and developing alternative energy sources. «The installation of energy-efficient LED lights, — says head of the Laboratory of Physics of Solar Cells Professor Alexey Yurchenko — was completed in the summer. Now the system of local electricity supply gives electricity to real consumers». In order to enable this, on the roof of Building 18 supporting structure manufactured by FRISD were mounted that contain photovoltaic converters made of monocrystalline and multisilicon with the total peak power of 3 kW. Nearby the two wind power installation (1 kW each) have been mounted. There is also a battery pack and a power electronics rack, which provides the supply of electricity to illuminate audiences, as well as the power for LED lights, illuminating the facade and courtyard of the institute. Such a hybrid complex of autonomous power is efficient enough to convert solar and wind energy to electrical energy. And if required it can easily provide uninterrupted power supply for a housing complex of two low-rise buildings. The total costs, including installation and equipment (depending on configuration) amounts to 1-1.5 million. All the work is carried out in cooperation with a strategic partner of the Institute — JSC «Federal Research Institute of Semiconductor Devices» — with the participation of the Research Laboratory of Physics of Solar Cells at the Department of information and measuring equipment of the Institute of Nondestructive Testing.